I recently learned President Ronald Reagan designated 1983 as the national Year of the Bible. I seriously doubt such a proclamation would pass Congress today. The liberal media regards expressing one's Christianity publicly as repulsive as showing Dracula the cross. 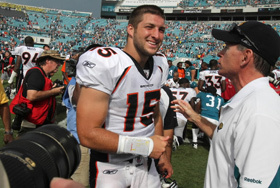 Tebow is now a pro football rookie quarterback with the Denver Broncos. Some sports analysts and media say Tebow does not have the skills needed to "make it" in the NFL. While some of the naysayers and criticism may be justified, some desire to see Tebow fail because he is so outspoken regarding his Christian faith. My doc says exercise helps control my diabetes. That Sunday, I was at the gym on the ellipse machine watching the Denver/Miami NFL football game. It was Tebow's first start as a pro. An elderly husband and wife couple approached the aerobic section. They visually scanned the bank of TV sets. I suspected they were looking for the Tebow game. I was correct. I asked, "Are you folks Tebow fans?" They smiled and replied, "Yes" I said, "So am I." The woman said, "Thank you." Something in her voice told me their support of Tebow extended beyond football. I suspect millions across America share similar feelings about Tebow. Rather than giving you a play by play of the game, let's say for 95% of the game, Tebow's performance was unimpressive. Miami was beating Denver 15 to zero. Then, with 2 minutes left in the game, Tebow brought his team back to tie the score. Tebow's team won the game in overtime. Wow! When interviewed after the game about his amazing comeback and win, Tebow said the last thing I am sure the liberal media wanted to hear, "First, I would like to thank my Lord and Savior Jesus Christ..."
Folks, I yelled, "Yes!" and felt a little tearful. Please do not get me wrong. I am not suggesting Tim Tebow walks on water. I am saying that in our culture which celebrates crudeness and the lowest common denominator, it is extremely refreshing to see this young man boldly standing up for traditional wholesome principles and values. Unquestionably, the American left has launched a war against Christianity. We are lectured and threatened with political correctness to respect every religion under the sun except Christianity. It is open season on trashing Christians in movies, political interviews and etc. The Christian is portrayed as the nut job, the loser or the nerd. Rumor has it, Tebow is an extremely hard worker and a born leader; sounds similar to a fire ball from Wasilla Alaska who is also despised in the liberal media for similar reasons. Be prepared for an all out campaign by the left, throughout his pro football career, to destroy and discredit Tim Tebow. Thus far, Tebow has done three things to infuriate the left and secure his name permanent residency on their excrement list. First, Tebow dodged being aborted and went public with his story. Second, Tebow won his first game in the NFL and publicly thanked Jesus for it. Dem there is fightin' words to the left! Third, without being intentionally political, Tebow's life promotes Conservatism. Culturally, we have fallen a long way from President Reagan declaring a national Year of the Bible. Such a proclamation would be impossible today. Tebow publicly thanking Jesus in a secular setting is deemed fanatical by liberal media standards in America today. And why is the left so angry and threatened by Tebow's mom's decision not to kill him? Congratulations Tim Tebow on your super NFL debut. Millions are praying for you. And thanks for scoring one for us Christians.